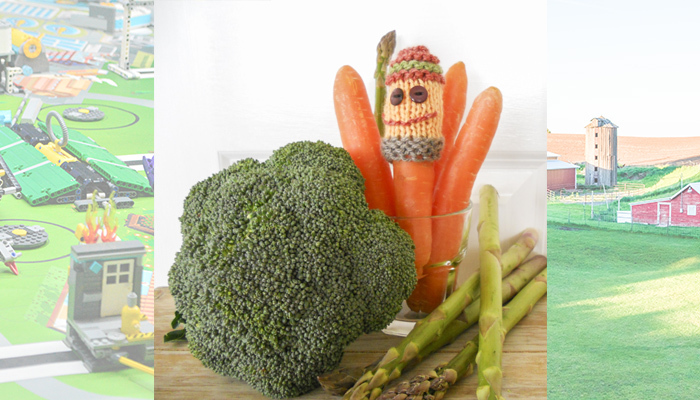 Create a community of colourful ‘vegie people’ and let the kids to unleash a world of creativity. Using C1 cast on 15 stitches. Change to C2 and work 10 rows stocking stitch, beginning with a knit row. Change to C3 ( beanie colour) and knit 2 rows. Change to C4 ( beanie stripe), knit 2 rows. Change back to C3, knit 4 rows. Break off yarn and draw up tightly. Fasten off. Sew on buttons for eyes using sewing needle and suitable matching cotton thread. Embroider mouth or other features as desired. Turn inside out and sew back seam neatening thread ends as you go. Add strands of yarn to your puppet to make hair, embroider eye brows or add a bobbly nose. Add sparkles, beads, sequins or any other bits and bobs you find in the craft box. Now it’s time to have fun with your vegie people! Create a box city for your vegie people to live in; build a farm for them to work; forge a secret den for them in the backyard, and let young imaginations run wild.